During 2015 the vibe around this film was that it would the one to beat at the Academy Awards. As it turned out, The Revenant took that honour, but that does not diminish the quality presented here. 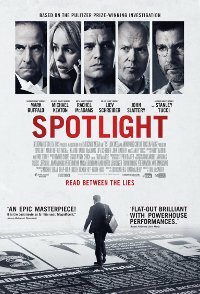 Spotlight tells the riveting true story of the Pulitzer Prize-winning Boston Globe investigation that would rock the city and cause a crisis in one of the world's oldest and most trusted institutions. When the newspaper’s tenacious ''Spotlight'' team of reporters delve into allegations of abuse in the Catholic Church, their year-long investigation uncovers a decades-long cover-up at the highest levels of Boston's religious, legal, and government establishment, touching off a wave of revelations around the world.